Hi! 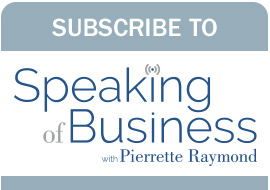 I’m Pierrette Raymond, your host of Speaking of Business a podcast for visionaries & leaders looking for expert tips and strategies to grow their businesses, live their visions and missions, while creating the impact only they can make. Through Speaking of Business, Pierrette will introduce you to visionaries and leaders who live and breathe the vision and mission of their companies, all while having a deep desire to have a big impact in their communities and the world. If you are ready to follow our vision, live your mission and create the impact that only you can make, let’s start Speaking of Business!